Hope you are having a great weekend. I just finished cooking, serving and enjoying today's lunch of baby potato fry, garic rasam and yellow pumpkin vathal kuzhambu . Simple meals are so satisfying . Talking of simplicity , I always remember the simple and melt in the mouth, 'Khichdi'. 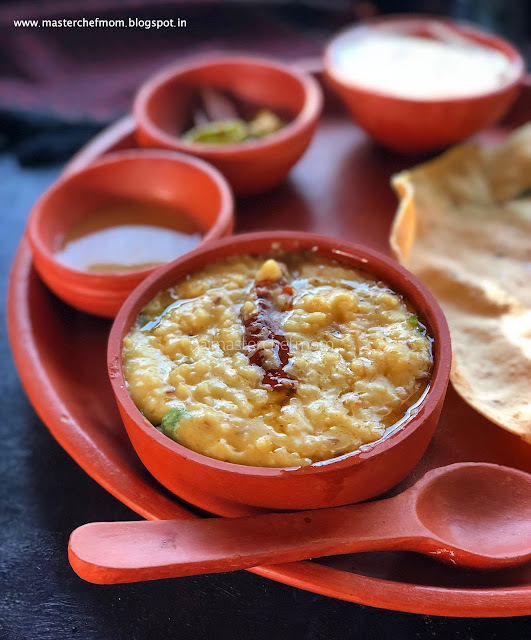 Being a huge lover of Pongal, I naturally loved Khichdi, the very first time I tasted it in a Gujarati restaurant, two decades ago. 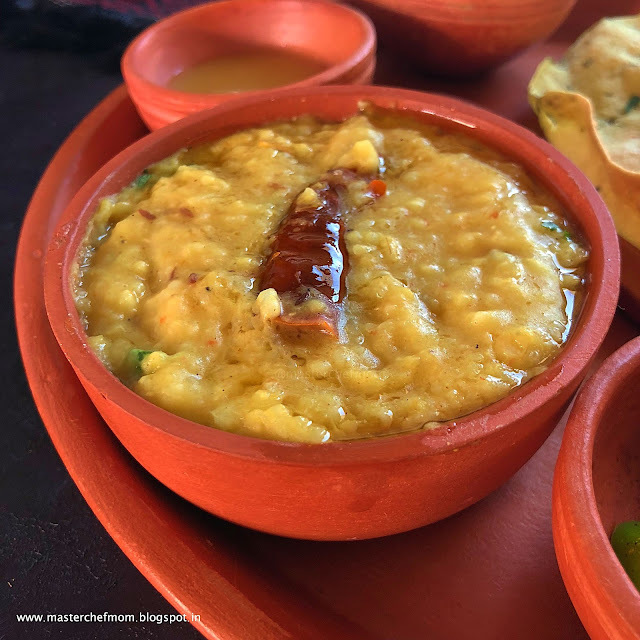 Khichdi is a wholesome dish made using rice and lentils. 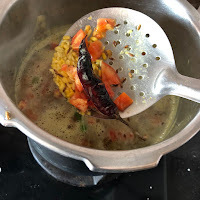 Many different types of Khichdi is made in different parts of India. 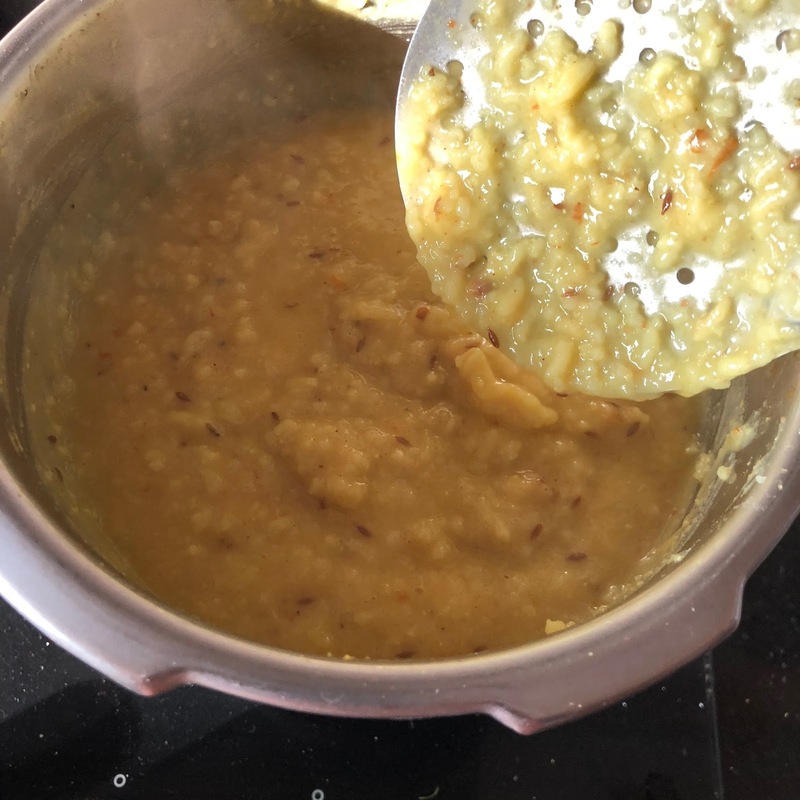 Khichdi is soft food and is good even for people with weak digestion . It is wholesome and recharges one with much needed energy. It is a delicious one pot dish . 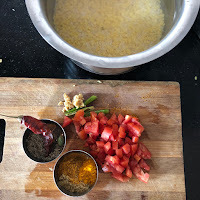 I have earlier shared the Rajasthani Style plain Khichdi recipe. Khichdi is traditionally served with ghee, pickle, papad and curd. 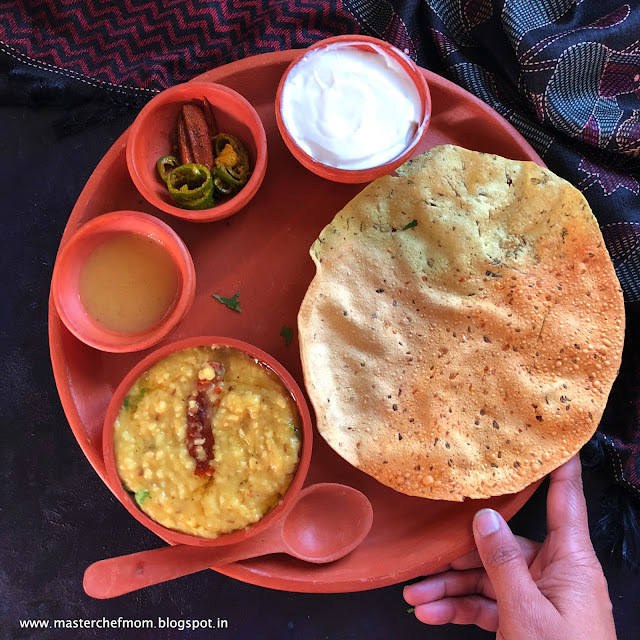 There is a popular saying in Hindi Language about how Khichdi should be served, " Khichdi ke chaar yaar- ghee, dahi, papad aur achaar". So , when you make Khichdi next time, don't forget to fire roast some papad and enjoy this scrumptious meal. Note : I have used only tomatoes . You can also use chopped potatoes, carrots, beans and peas. 1. Wash rice , moong dal and soak in four cups of water for 30 minutes. 2. Heat a pressure pan with ghee over low flame and temper with all the whole spices given under ' first tempering'. 3. 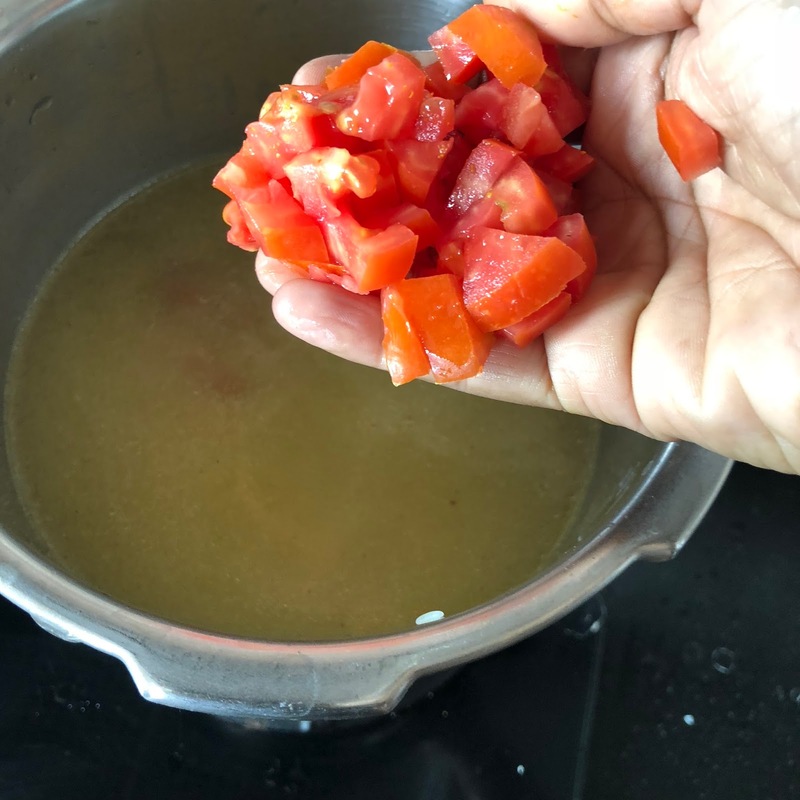 Once tempered, add the soaked rice and dal along with water. 4. 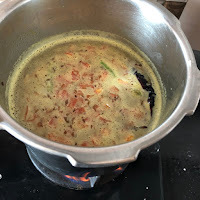 Add all the spice powders, tomatoes, green chillies, ginger, salt and pressure cook upto 4 whistles over low flame. 5. 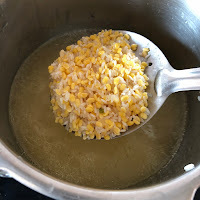 Once the pressure releases, mash the mixture well using the back of a ladle. 6. 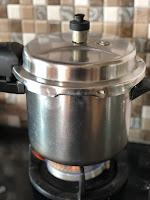 Place it back on low flame and add 1 cup of boiling water to the mixture and mix well. 7. Add more water and let the mixture become loose. 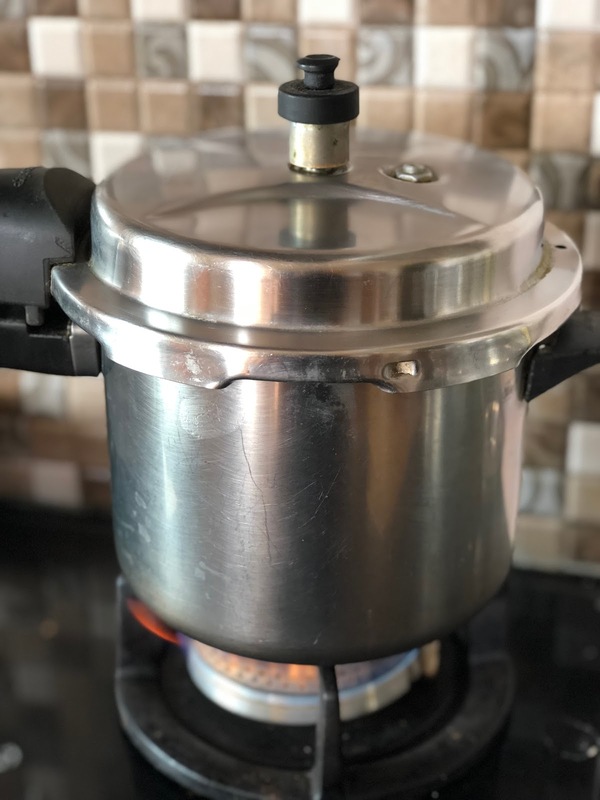 Chef tip : I added 3 cups of boiling water, little at a time, stirring continuously. 8. Once you achieve the desired consistency, switch off. 9. Taste and adjust salt. 10. 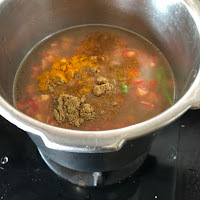 Now heat a small ladle with ghee and temper with cumin seeds, red chilli and asafoetida. 11. Pour it over the Khichdi , mix and serve hot.